It’s Raining Pumpkins, Spider Mites and Muffins—Oh My! I had it all planned out since the inception of my blog. October was going to be PUMPKIN MONTH. A pumpkin recipe a day week for those people, like me, who are pumpkin obsessed maniacs. But like most other things, life had its own mission and I am simply a passenger hanging on with a fierce grip, a half smile and a determination to go where it takes me. For those of you who have been following my blog like it’s the latest edition of the New York Times, you are fully aware of, and perhaps perturbed by, my obnoxious fascination with pumpkins and jealous of my amazing pumpkin delivery service–a.k.a my mom the pumpkin gardener extraordinaire. You should definitely be jealous. I have had pumpkins most of the summer and had two I was roasting last night for these muffins. This is why pumpkin month in October turned into pumpkin August, September and soon to be October. Her urban garden, indecently exposed in her front yard for all to see and drool over, is a sight to behold. Let me give you the run down of what’s been growing there all summer—zucchini, three tomato varieties ranging from heirloom to cherry to run-of-the-mill, pumpkin, spaghetti squash, Swiss chard, beets, various lettuces, rosemary, basil, thyme, watermelons, a peach tree, and…I am sure I am forgetting a handful of other fruits or veggies. Unfortunately, I have not had quite the same success in my garden. Here is my treasure trove from my backyard garden attempt—two kinds of tomatoes, both attacked and savaged by one conspicuously chomping Golden Retriever and hundreds of spider mites, and one pot of golf-ball shaped cucumbers which are so dang prickly that once I peel away the prickles, there is only a microscopic amount of cucumber revealed—delicious! 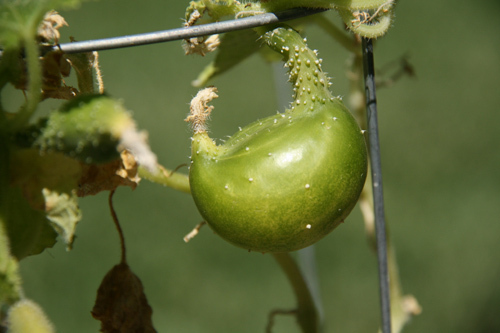 See that lovely cuke above? Please note the sarcasm. I am actually inexplicably successful with herbs…perhaps because they are difficult to kill. My basil is growing with wild abandon, and my lemon thyme and rosemary are thriving as well— and they are all edible! Woo hoo…I am the gardening fool now! No? I suppose not, but a fool I am anyhow for continuing to trudge on thinking some miracle will happen in my garden/spider mite sanctuary. Ok…I am fully aware I have lost you now…you came for the muffins, didn’t you? Not the endless whining about my pitiful garden. Thank goodness I am a far better baker than gardener, and for that I am eternally grateful (and so are the people around me). These muffins are a copy cat version of Starbucks’ Pumpkin Cream Cheese muffins. They are EXACTLY like the yummy version at that Nieman Marcus wannabe coffee house (I was raised in the 80’s– no other explanation necessary for the use of wannabe) without the uber expensive price tag and WITH fresh pumpkin and other organic, natural ingredients I am so famous for. What?!!! I am NOT FAMOUS? ! CRAP! I was sure this blog was catching on world wide. Can you tell a friend or two? Maybe then 10 50 people will be reading my blog. THANKS! Much appreciated…oh and try these muffins. 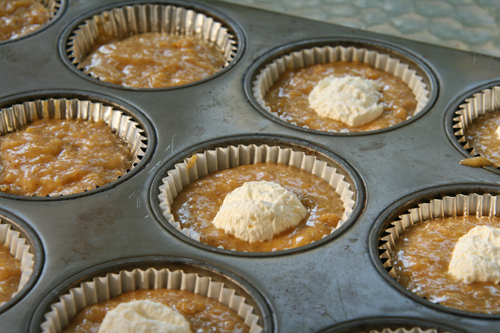 Preheat oven to 350 degrees and line a muffin pan with baking cups. Sift together dry ingredients, flour through salt, into a medium mixing bowl. 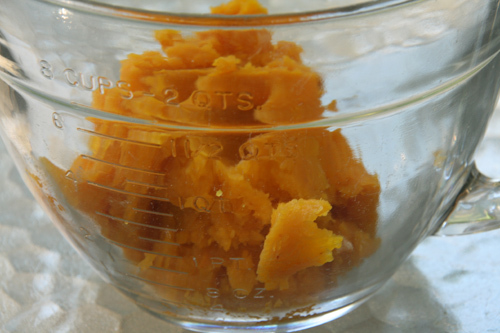 In a large glass measuring cup (or mixing bowl) , measure pumpkin and oil. Add sugar and eggs and beat liquid ingredients together. Pour the liquid ingredients into the dry ingredients and combine thoroughly with a rubber spatula without over mixing. Using a large ice cream scoop, spoon batter into muffin cups to 2/3 full. Using a small spoon or very small scoop, dollop teaspoon sized amounts of cream cheese into the center of each batter filled muffin cup. Gently push down on the cream cheese with your finger to help the cream cheese sink into the batter. Top each cup with another spoonful of batter and smooth with a spreading knife to cover cream cheese entirely. 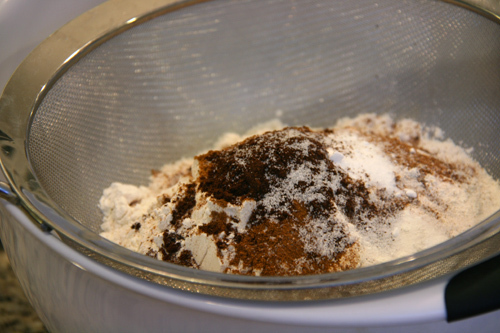 Streusel topping: In a small bowl, mix together brown sugar, flour, cinnamon and butter. Using a fork or hands break the butter into the sugar mixture. 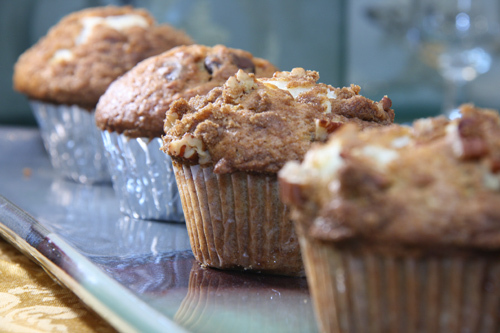 Sprinkle a little less than 1 T. of streusel topping over each muffin and sprinkle with chopped pecans if desired. Instead of adding cream cheese to some of my muffins, I sprinkled in chocolate chips per my son’s request and did not top those with the streusel mixture. That was a yummy variation as well. Bake for 20-25 minutes, testing with a toothpick for doneness. Your muffins should be nice and orange colored, not a dark brown and the muffin should be slightly springy and soft when you touch it. The pecans can burn easily so don’t over bake. Cool to desired temperature and EAT! Categories: Bread, Pumpkin | Tags: Starbucks pumpkin cream cheese muffins | Permalink. I know I already sent you an email about this tasty morsel, but I’m adding it here for the world to see!! I can tell all of you that these are so very, very yummy!!!! Great job as always! I’m telling you, you need to open up your own bakery!!! Glad you enjoyed it! Now we just need a pumpkin spiced latte to go with it. Mmmmmmm. Geni, these muffins look amazing! Photos are awesome as well.. Perfect timing Geni!! I got a baking pumpkin in my CSA bag last week. I had no clue where to even begin, and this is perfection. I also think I have every ingredient in my house-including cream cheese which I rarely have on hand. Thanks Leah…enjoy! If you need help with steps to cook your own pumpkin, check out my Bundt that is Sunny Side Up under my Cake section in recipes. Yum! so you put cream cheese in the muffins? Yes! It makes a nice bite of creaminess in the muffin. 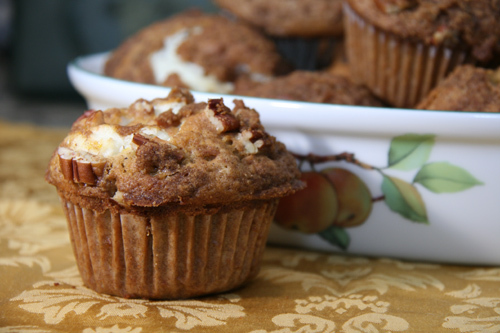 I love the idea of cream cheese in this cute muffins. They look dreamy:) great post! When I first tried these gems at SB, they were so good I had to find out how to make them myself. Drink a great cup of coffee with it and let me know how it goes! Hi, Geni. I think these muffins would be perfect on an autumnal morning with hot coffee. The first wannabe – you made me want to use this word! – pumpkins (the mallocreme candy version) are already appearing in stores. But they are not so natural or organic and thus wouldn’t appear in your famous site! Hi Dan! I think I would like to try the mallocreme candy version. I don’t believe I have ever seen those. I am not vehemently opposed to anything tasty…I just prefer to bake as naturally as possible. Thanks for stopping by! These sound so incredibly heavenly. Oh how I want one this instant! These are awesome! Light, tasty and down right delicious. Thanks for the recipe. This is something we could try, my daughter likes to bake muffin and yours look awesome. But, really, I won’t be humble about these muffins either. They sound delicious!